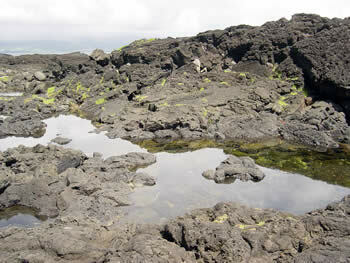 We have received many calls for turtles stranded in the tide pools at Richardson’s Beach Park, Hilo and we are conducting a study on the ability of turtles to escape from these tide pools during high tide, to return to the ocean. Remember, turtles are strong animals, and capable of reaching the ocean when the tide is high. 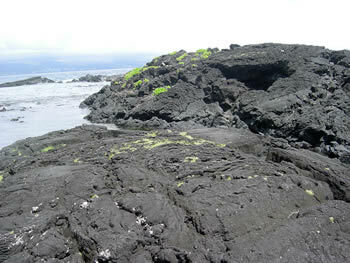 Many turtles get washed into the tide pools during storms, but have been able to exit on their own. The turtles also use the ponds to rest, so please DO NOT DISTURB them. 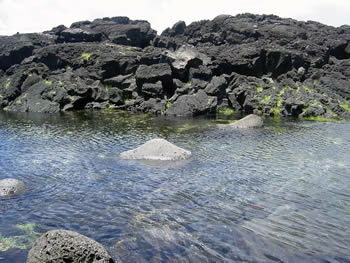 General View of the Back Tide Pools at Richardson’s Beach. The Main Pond is in the background, with Side Pond #2 in the foreground. 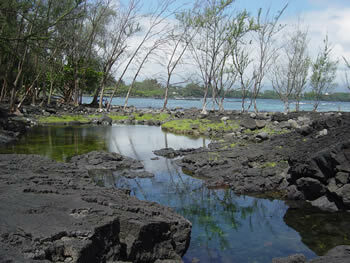 Notice that the two ponds appear to be somewhat connected between high and low tides. 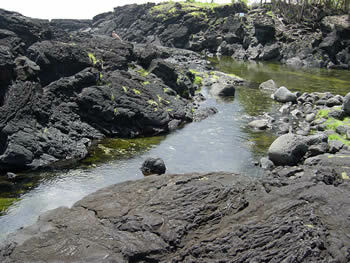 Behind the tide pools is one of the entry points from the ocean into the tide pools. It’s possible that the waves may get large enough in storm conditions to wash turtles into Side Pond #3. This is a view of Side Pond #2, at the time, there were no turtles there. At low tide, Side Pond #2 looks completely separated from Main Pond #1, but at high tide the two ponds are connected by a channel, seen in the top left of this picture. 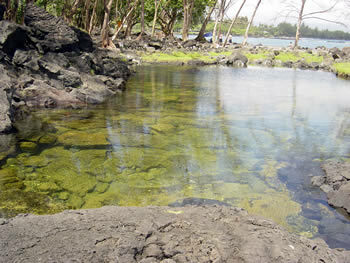 This is the Main Pond #1, where most turtles are found resting at the bottom of the pond. Please DO NOT DISTURB them. Most turtles can get out on their own when the tide is high. There was one small turtle seen in this pond on May 31st 2004. This is the exit of the channel from Main Pond #1 to the ocean which is the route we think most turtles use to return to the sea. Unless there is a boulder blocking this channel, turtles should have no problem returning to sea. The entrance to the channel from Main Pond #1 to the ocean is seen here. There are some rocks, but the narrowest distance between boulders in this channel was 6 feet. Turtles may get trapped if there is a major channel block here. Main pond #1 is in the background. This is the same entrance to the channel from Main Pond #1 seen in the previous picture, but at High Tide. Notice how the boulders get submerged. 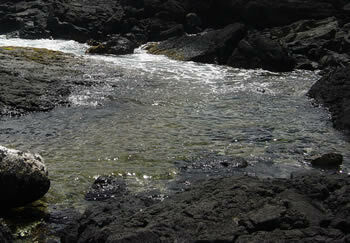 Turtles should have no problem swimming through here to get in or out of the tide pools. 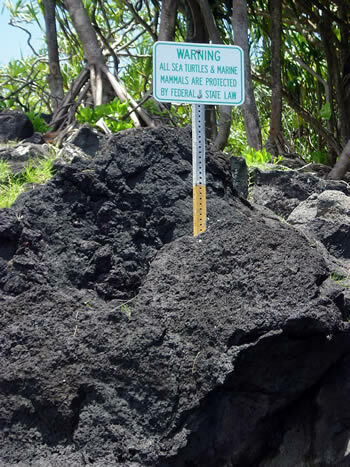 Sign posted by the tide pools. Remember, turtles are Protected by Law, please show them respect, and let them rest.